The University of Perpetual Help recovered from a rusty opening set and a fourth frame scare before finishing off College of St. Benilde, 23-25, 25-17, 25-17, 25-23, Friday in Game 2 of the Finals to retain the crown and complete a clean sweep of the NCAA Season 94 men’s volleyball competition at the FilOil Flying V Centre in San Juan. Two-time Most Valuable Player Joebert Almodiel connived with Ronniel Rosales and Ridzuan Muhali to deliver the Las Pinas-based squad’s 12th title overall. Almodiel, who was named Finals MVP, fired 19 points while Muhali had an all-around perfomance with 19 markers with all but one coming off attack and 11 digs for Perpetual, which uncorked 57 spikes and 11 kill blocks. Skipper John Patrick Ramos and Rosales scored nine each. Perpetual staved off the furious comeback attempt of the Blazers in the fourth set as CSB dropped a 14-4 rally to cut a 7-18 deficit and breathe down the necks of the Altas, 22-21. Gabriel Casana gave Perpetual some breathing room with a heady dropball but committed a service error in the next play. Almodiel put the Altas at championship point Ronniey Adviento saved a match point. Almodiel sealed the championship by pounding the game-winning down the line hit. The Altas survived a tough challenge put up the Blazers in the best-of-three series opener, 23-25, 25-20, 23-25, 25-23, 15-12, last week. Adviento and Rookie of the Year Ruvince Abrot posted 12 points each while Francis Basilan had 10 for CSB. 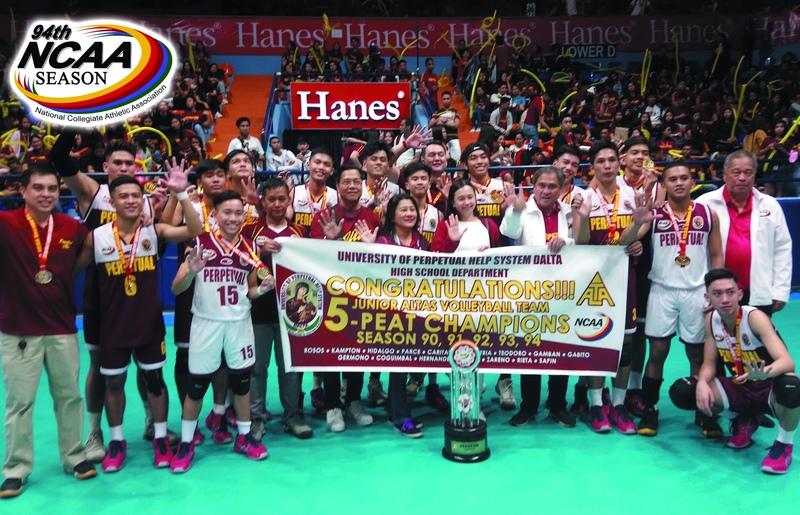 Meanwhile, the unbeaten Junior Altas cruised their way past Letran, 25-19, 30-28, 25-17, to extend their reign in the high school division to five straight years. 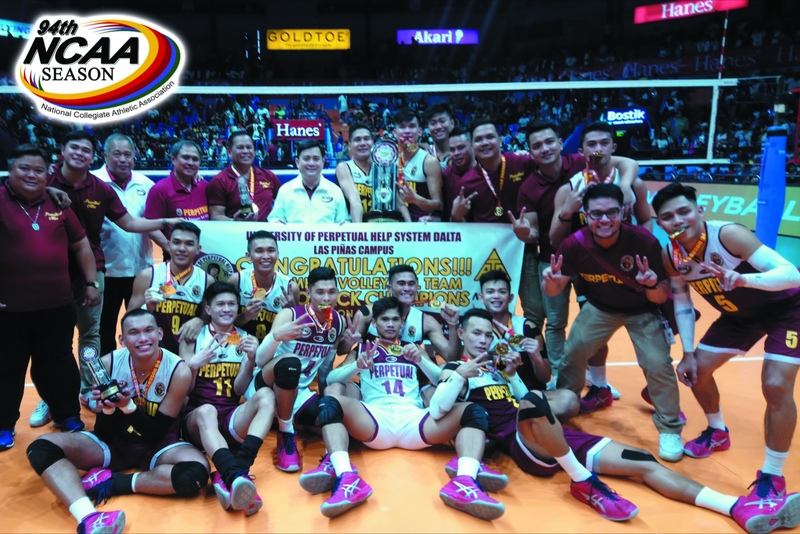 Perpetual claimed its 11th overall crown after sweeping the Squires to complete a perfect season. Noel Kampton, who bagged the 2nd Best Open Spiker award, finished with 21 points including 19 from attacks while Finals MVP Hero Austria and Kirth Rosos posted 10 markers each for the Junior Altas, who destroyed Letran in just 58 minutes. Season MVP Christian Dela Cruz was the only Squire in double figures with 10 points while John Paul Lorenzo and Mark Omega posted nine and eight markers, respectively.